Heads up: Fletcher’s autobiography is released on November 5. Digby, the publisher’s PR, might even have some early spare copies for some lucky winners here and at Cricinfo. Otherwise, pre-order at Amazon for an amazing Â£9.49 (the retail price in Waterstones and co will be Â£18.99!). 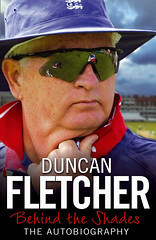 This entry was posted in Cricket and tagged autobiography, behind the shades, duncan-fletcher. Bookmark the permalink.